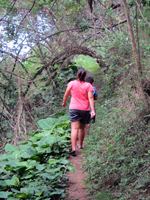 Friendship Garden: A Steep Uphill Walk through Nature. 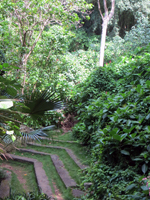 Friendship Garden: A Steep Walk through Nature! My son was barely four years old when he took the Friendship Garden trail to the top for the first time with my nearly 70-year-old parents. 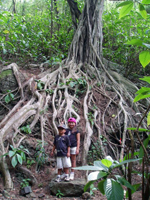 And the last time my kids and I visited this Hawaii attraction, we did it on the spur of the moment without any advance planning. We were all wearing flip-flop style rubbah slippahs; and we didn’t bring any drinks or snacks. Although I don’t recommend going without something to drink, we were perfectly fine just because this isn’t a very long walk. 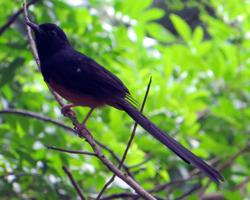 In that sense, the Friendship Garden trail, which is located along the southwestern shore of Kaneohe Bay, is an ideal outdoor excursion. 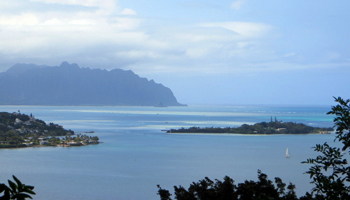 You’ll get to see a good sampling of Hawaii’s exotic plant and animal life followed by a breathtaking view of Kaneohe Bay – from the Marine Corps Base to Chinaman’s Hat. Better still, it doesn’t take all day and leave you too tired to do anything else. 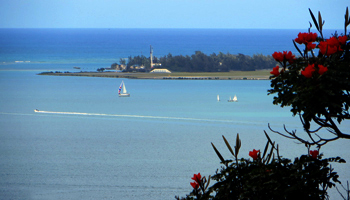 So if you’re out doing a bit of scenic Hawaii sightseeing, you could easily climb up for an unobstructed view of Coconut Island, a Hawaiian fish pond, the Kaneohe Bay sandbar, and more! Although the perspective isn’t quite as spectacular as from the Puu Maelieli trail, it’s hard to find a bad angle for enjoying the natural splendor of Windward Oahu! From Waikiki/Honolulu: take H1 freeway west to Likelike Highway (HI 63). Continue on HI 63 through the tunnel. From Ko Olina Resorts: take H1 freeway east to H3 freeway. Continue on H3 through the tunnel to exit 9. Merge with HI 63. Continue on HI 63 across Kamehameha Highway and the road becomes Kaneohe Bay Drive. Drive past Windward City Shopping Center, Castle High School, and Bay View Golf Course. Look for Community of Christ church on your right. The second intersection past the church is Kokokahi Place. Turn right and continue uphill until the hairpin turn. 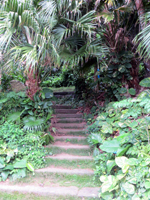 The entrance to Friendship Garden is barely visible as some grass and stone steps in a narrow opening between the bushes and trees. The well overgrown signs are difficult to see at best (see photo at bottom), and absolutely impossible to find if cars are parked on the side of the road at the entrance. Forget about finding the signs and just look for the stairs and/or the hairpin turn in the road. As for the parking… there is enough room for two or three cars to parallel park at the entrance. Beyond that, you’ll just have to find whatever you can in the neighborhood. Please keep in mind, however, that this is a narrow residential road. The local residents are bound to be upset if you obstruct traffic or any driveways. Please don’t do that. There are no restrooms, water fountains, or other such facilities at Friendship Garden; and there is nowhere handy that I can easily tell you to go for these conveniences, except maybe one of the area shopping centers. Nevertheless, please don’t trouble the neighborhood residents looking for any such amenities. The windward side of the island is beautifully green and lush because it’s commonly the rainy part of Oahu. Thus, if it’s raining, or if it has been recently, the Friendship Garden trail will likely be muddy and slippery. 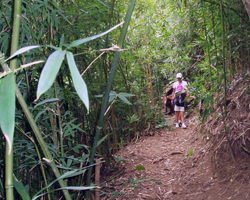 When that’s the case, I’d suggest finding some other Oahu Hawaii activities to do that day (I’ve got more than 100 suggestions) and try this trail again later. Not only will a clear, dry day save you from possible injury and probable mess, but you’ll also enjoy a more majestic, full-color view.